As the War of 1812 rages across the newly formed United States, another war rages in Fiona Lanier's heart--one that threatens to tear her family apart. Fiona can scarcely take in the news of her brother's capture and imprisonment by the British Navy. It is almost as unbelievable as the half-drowned British sailor who is washed ashore on the beach of Navy Cove. Charlie Kincaid claims to have no memory of his life before being discovered by Fiona, but in a world that seems saturated with treachery, she cannot be sure he is telling the truth. As Charlie's memory returns in agonizing jags and crashes, he and Fiona discover that falling in love may be as inevitable as the tide. But when political allegiances collide, they'll each have to decide where their true loyalty lies. Beth White's day job is teaching music at an inner-city high school in historic Mobile, Alabama. A native Mississippian, she writes historical romance with a Southern drawl and is the author of The Pelican Bride and The Creole Princess. Her novels have won the American Christian Fiction Writers Carol Award, the RT Book Club Reviewers' Choice Award, and the Inspirational Reader's Choice Award. Learn more at www.bethwhite.net. White does a lovely job of creating a picturesque setting that accurately details the Gulf Coast. I love the historical accuracy of this novel. As a history buff, I am always intrigued to delve into specific time periods and this book doesn't disappoint. 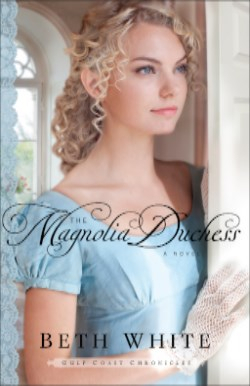 I very much enjoyed the steady pace of this book and learning about the characters of this time period. Not having read the first two books of this series, I can say Magnolia Duchess can stand alone as a great book for others who may have not read the previous books. If you are a fan of historical romance with a touch of political adventure, you will likely enjoy this book.